DETAILED FESTIVAL MAPS AND PARKING LOCATIONS WILL BE POSTED IN EARLY FEBRUARY. 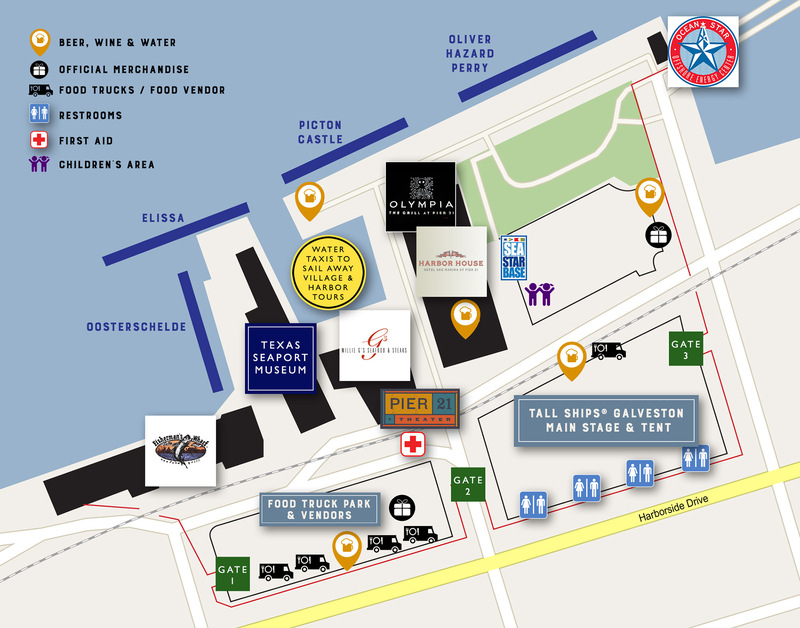 The ticketed festival area of TALL SHIPS® GALVESTON will be held from Pier 20 – Pier 22 and Harborside on Galveston harbor. Additionally, programming on The Strand, immediately across the street from the festival, will occur throughout the weekend. Three main locations are available for general festival parking with a scheduled shuttle between parking and the event entrance. Parking is $20 per car, per day at 3402 Seawall and 3402 Church Street. Parking is $12 per car, per day at Stewart Beach. Spots are available beginning at 9 a.m. daily at these locations. Shuttle service runs from 10 a.m. to 9 p.m. daily. Please note: Parking will be available for Sail Away guests all three days. However general festival parking is only available on Saturday and Sunday. Going on a sail away or looking for a unique way to enter the main festival grounds? 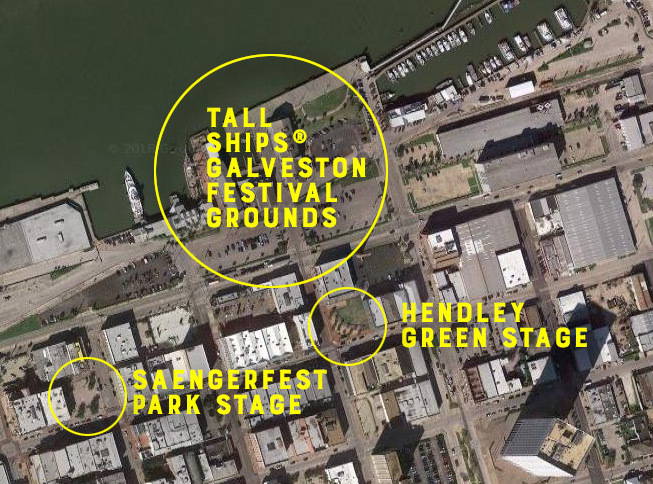 Texas A&M University Galveston (TAMUG) will be providing paid parking for our sail away reservations and guests wanting to travel to the festival grounds via water taxi. 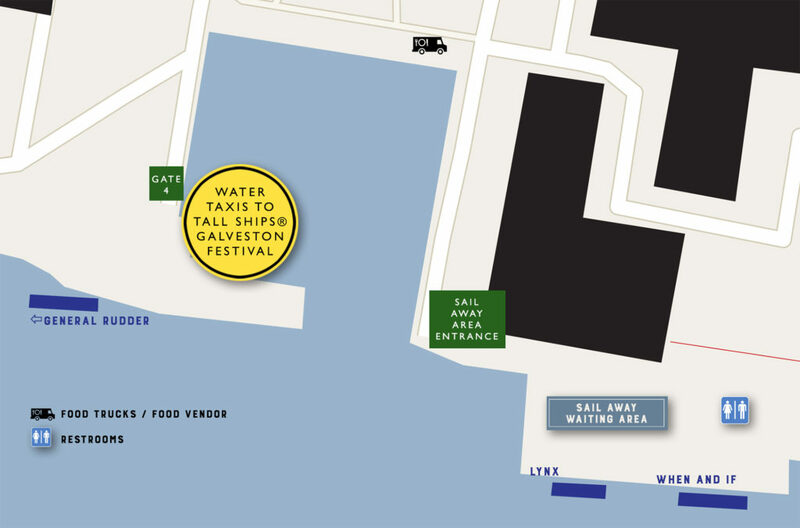 Water taxi service is free and on a first come / first served basis and will run every 30 minutes between the main festival location at Pier 21 and the sail away village at TAMUG. 1. Best Value/Preferred Method – Purchase a conference parking permit for only $5/day. You can purchase this permit online, print your confirmation, and place on your dashboard. Click here to purchase now. This is the quickest method to get into the parking lot, park, and enjoy the festival! Downtown Galveston offers numerous public parking spots through various garages, surface lots and paid street parking. Downtown parking garages available at 2100 Mechanic and 25th & Harborside. Street parking is available throughout downtown. Details on rates and accessibility are here. Tickets are non-refundable. The festival is open rain or shine. GHF is not responsible for independent transactions between visitors and vendors. We are committed to making the event special needs accessible. If we can assist with arrangements, please contact us at 409-765-7834 in advance of your visit. Open carry firearms, pets and ice chests are not allowed. Scooters, skateboards, rollerblades, skates, Segways and other recreational “wheels” are forbidden. Guests bringing in costume weapons and props must have them secured and will be asked to go through additional screening. Are there maps of where the ships will dock? Entrance areas? Maps for both sites will be posted this week. 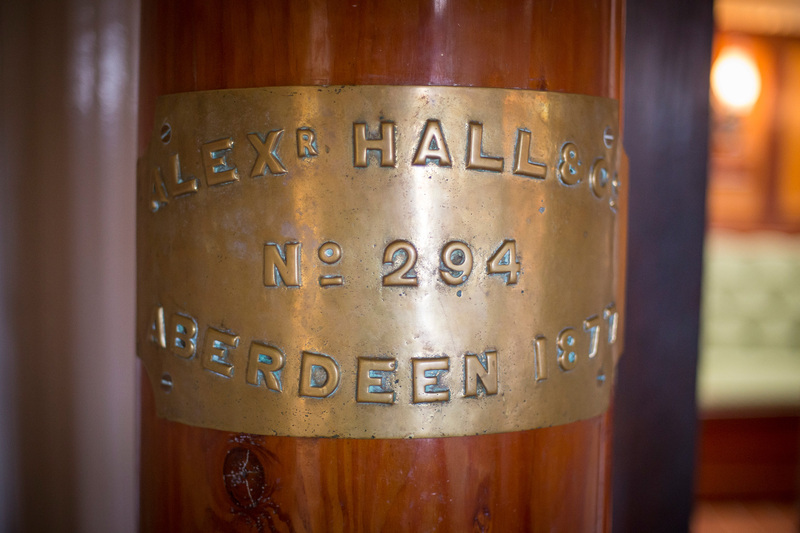 What are the dates for the Tall Ship Festival? April 5-8. Our schedule is available at http://52.15.118.96/events/tallships/schedule. How much are tickets and where can they be purchased? Where on Steward Beach will the shuttle pick up riders? There is a trolly station kiosk near the parking area that the shuttle will pick up at. There will be volunteers there to assist. Will the water taxi be running on Friday? Absolutely! Shuttles are free of charge. Water taxis are free with paid festival admission. We are attending on Friday, and are A&M grads. Can we park at TAMUG and take the water taxi from there? Chris, only day sail parking is available on Friday at TAMUG. You will need to use one of the other lots to access. Although water taxi usage will be available to go to TAMUG (taxis are free) all day.